The feature helps you find photos you uploaded on Google+ by typing the “my photos” prefix followed by your search term in the Google Search box. 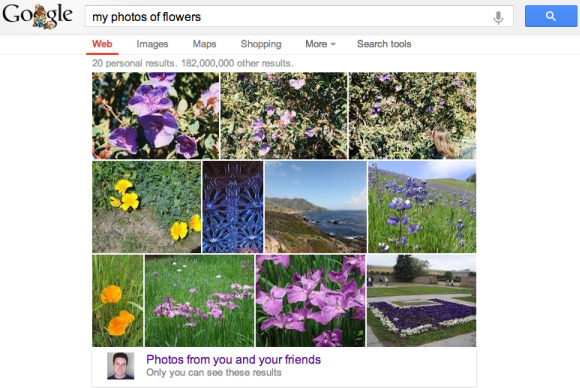 What’s interesting about this feature is that thanks to a hefty dose of maching learning, Google can recognize general concepts in your photos, so you can search for specific terms such as food, flowers, or sunsets rather than relying on file or album names. For example, you can search for “my photos from San Francisco last year” or “my photos of food” and Google Search will display a set of results from your uploads. Google says this feature works only when you are signed into your Google+ enabled Google account, and the results are only visible to you, although they are displayed from the main Google Search page. Those are called Google field trials and are limited to @gmail.com users in the U.S. If you sign up, Google Search will be able to pull from your inbox relevant information on your flights (search “my flights”), upcoming calendar events, documents stored on your Google Drive, recent receipts (search “my purchases”), event tickets you bought through Ticketmaster or Eventbrite (search “my events”), and event hotel or restaurant reservations (search “my hotel/restaurant reservations”).